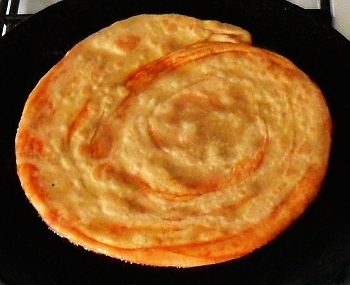 This, recipe extends the spiralled paratha by wrapping a spiral around into a spiral, enclosing a mobile filling so that it doesn't run out of the paratha whilst being eaten. You can seee the page on different types of paratha (with links to a recipe of each type) by clicking here - Paratha types page. 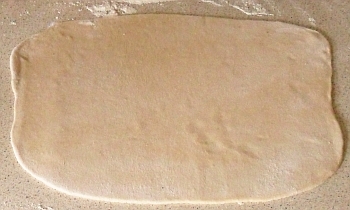 Mix the flour and the water to make a nice soft dough. Cover it with a clean dry tea-towel and leave it for 20 minutes to relax. 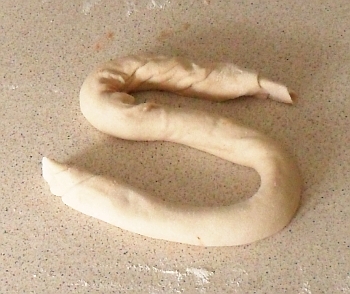 Roll the dough so that it forms a cylinder that is roughly 5cm in diameter and cut it into 5cm lengths. 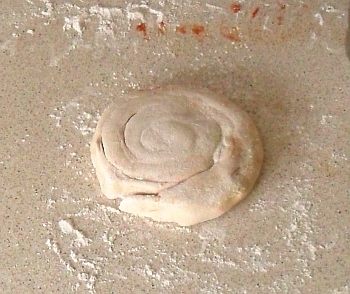 Divide any remaining dough up equally between the pieces and roll them into balls. Take one of the balls and roll it out to make a large rectangle. 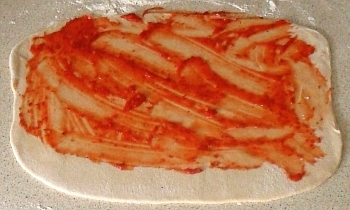 By diong this, we are doing most of the rolling out before we have put the filling on it - doing more of the rolling out later means that the filling would have more of an opportunity to mix in with the dough and we are trying to avoid doing that. a gap around the edge to seal it. Spread a thin layer of the filling out, over the rolled-out dough so that you leave some space at the sides and a bit of space at the bottom. stretching it into a long roll. Dampen the clear border with a little water - not too much as we don't want to form a slurry, we just want to make it sticky. Roll it up so that you minimise the amount of air caught in the roll. As you roll it, stretch it a little and then, seal the ends. Roll up the roll into a spiralled spiral. Curl it around to make a spiral - a spiralled spiral. Press it down a little bit so that the coils take up the spare room at the top and bottom, making the top and bottom of the paratha flat, like so. 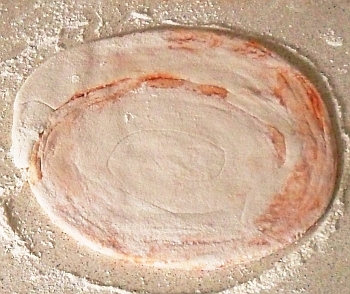 Dust it with flour and start pressing it, a little bit at a time, with your hands so as to make it flatter and bigger. Anywhere that a bubble of air bursts through, you are going to get a leak so where this happens, sprinkle some flour on it and make it non-stick again. Carefully roll out the paratha so that it has a thickness of maybe 6mm or so. 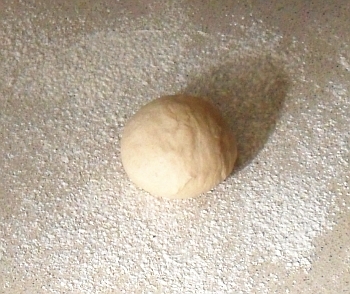 If you roll it out much thinner, you will end up just mixing the filling with the dough. 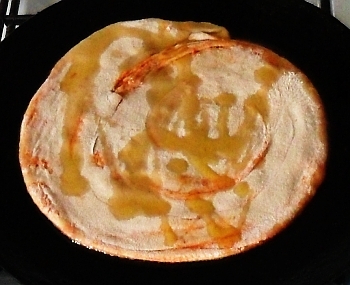 Fry the paratha on a hot tava. Put the paratha on a hot, oiled tava and fry it. Whist it is cooking the first side, sprinkle some oil on the top so that it is ready for when you turn it over. Cook both sides until they start to bubble. The paratha should bubble nicely as it cooks because you have, in a way made a sort of thick-layered puff pastry out of it with a rather interesting filling. Once it is cooked enough on both sides - and assuming that you didn't have it on too high a heat, therefore it is properly cooked all of the way through - turn it out onto a plate and cook the next one. This recipe should make four to six parathas, depending upon a lot of different things - the thicker you make them, the fewer you make and so on. They do store well and you can either half cover them with your favourite pickle and fold them in half, or you can eat them the way they are. Another satisfying way of eating them is to tear chinks off them and eat them with a nice pickle. You can see from the cross-section in the pictue below that the layers are quite visible. spiral clearly in the end roll of this one.